Stereoscopic 3D technology is being pushed by many consumer electronics manufacturers as the next frontier for your living room, and we have seen models which feature active shutter as well as passive shutter glasses, but the next big step would be to enjoy 3D viewing without the need to wear those glasses. Such thinking has seen prototypes being developed, and the same applies for computer monitors and now, tablets. 3D tablets might just be a niche market in the future, but that doesn’t mean there isn’t a market at all. Asus decides to push the envelope with their MeMo glasses-free 3D tablet over at Computex, with a codename ME173. 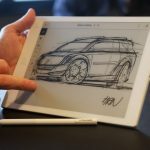 The 7″ display is capable of hitting a resolution of 1,280 x 600 pixels, where it will also be accompanied by a pen that features a rubber tip which should go some way in helping with inking precision.